Docking a single-engine boat isn’t as easy as it looks. Whether the marina is crowded with a dozen other boaters or not, you must still learn how to control and maneuver your watercraft so it safely lands alongside the dock without crashing into it. If your approach isn’t spot-on, you could accidentally hit the dock, causing damage to either it or your boat. Pay attention to both the surrounding elements when docking your boat. If the wind and/or current are going towards the dock, steer your boat in the opposite direction so it will naturally coast you towards the dock. If the wind is blowing away from the dock, approach with a steep angle and swing the stern of your boat towards the dock. Don’t let your pride get in the way of asking for help. Even the most seasoned and experienced boaters need a helping hand when docking from time to time. If you’re boating solo and need assistance, get on the radio to ask for help. You might be surprised to see just how many people are willing to take time out of their day to help. After a long day on the water, you’re probably eager to dock your boat and get on dry land. However, it’s important for boaters to go slow and steady when approaching the dock. Don’t succumb to the temptation of hitting the throttle, as this will only shift your boat’s course while increasing the chances of an accident. Let your boat glide towards the dock in idle without using the throttle. Make sure all of your lines and fenders are ready when approaching the dock. If you’re busy steering the boat, ask a guest on board to give you a helping hand. 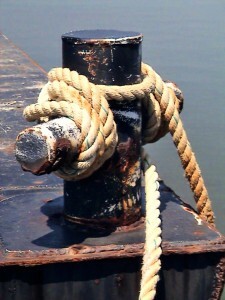 The spring line is the first line that should be used; it is placed through the boat’s cleat and secured to the dock. One all-too-common mistake people make when docking their boats is tightening the lines. Why is this is a problem? Boat lines should have slack to allow for the water’s rising and falling. Of course, this doesn’t mean your lines should have too much slack, as this can prove to be a problem as well.